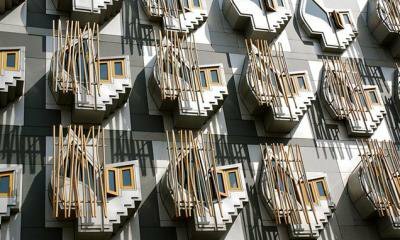 For Scottish architecture to flourish once again, Scots must regain their independence from the UK in the imminent referendum. You’d be forgiven for thinking that Scotland − facing a referendum on independence from the United Kingdom, and with the polls favouring ‘no’ but with all to play for − stands at the great, clichéd crossroads. But I think you’d be wrong. Whichever way it goes, history will see this as just another step in the final unravelling of the British Empire. The Union of Scotland and England, in 1707, never included Church, Law or Education (or football! ), and Scotland received substantial powers from the devolution referendum that re-established its parliament in 1999. Even in the event of a no-vote, all the ‘Better Together’ political parties are offering the devolved Scotland further powers, so that there will soon be very little reserved to London. This clear direction of travel relies on the fact that almost everybody believes that Scotland is a better place post-devolution - less chippy about its big neighbour and more comfortable with itself. What is remarkable is that what has been good for the nation as a whole has not, so far, been good for its architecture. If Britain post-Thatcher has chosen services over manufacturing, process over product and weird financial instruments over utility, then Scotland has pursued this path with demonic vigour. HBOS (whose headquarters my practice rebuilt) and RBS represent the very pinnacle of neoliberal financial idiocy but other, similar examples abound, from the bankrupt Rangers Football Club to the damage Scotland’s once-largest architects, RMJM, have done to themselves. Process reigns supreme here, so that our procurement structures for winning work are of an extra-Byzantine complexity, and our paths through planning and other statutory processes festooned by even more multiple box-ticks than down South. Scottish Government central procurement is based on a ‘hub’ system where the nation has been split into five regions with each allocated to huge construction conglomerates given entrenched monopolies and tasked to drive down costs and treat architecture as a ‘supply-chain component’. Pre-devolution, there was a brief flowering of architectural culture, but in such a climate it has struggled. The big, glamorous jobs have gone, without exception, to non-Scottish practices, while corporate practices do most of the rest. Tellingly, a Scottish-only shortlist today for an intricate, design-led arts project would be almost identical to one pre-devolution. An architectural culture which has nurtured no significant new practices in 15 years of apparent national reinvigoration is in trouble. There is, however, an upside. Contemporary Scottish architectural culture is interested in the built environment as a continuum of historic and modern building in a more complete way than elsewhere. There is an understanding of the importance of ‘place’ throughout Government, local authority and business which should, in time, provide fertile ground for thoughtful, responsible architecture. And initiatives like the Town Centre Review, which I led, are able to establish principles of democratic accessibility to the essential services that the built environment provides which will, I hope, refocus us on the vigour of our existing built environment. There are policies and agencies to assist − though it sometimes feels like the box-ticks obscure an absence of the critical, good architect-good client core. Even at their best, our positive architecture policies are like an expensive wee sports car - nicely designed and with all sorts of extra features fitted - stuck in a tug-of-war with a 10-ton, corporate procurement truck. Will we notice that the truck is gradually pulling us over a cliff? I hope so. And would Scottish independence help? Yes please. This article is crossposted with thanks from The Architectural Review.